Walk into the past at the Estorge-Norton Bed and Breakfast. 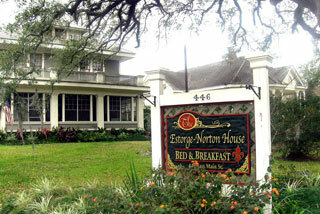 Circa 1906, the Estorge-Norton Bed and Breakfast is a three-story, bungalow home in New Iberia's Historic District. Tasteful period décor with comfortable antique furnishings throughout create a peaceful atmosphere for guests. Your hosts, Charles and Jo Norton bring a European ambiance and old world charm to their home. While at Estorge-Norton, enjoy a full plantation breakfast and spend a relaxing afternoon on the intimate verandah or back patio. Step off our porch into New Iberia's history and charm. La Belle Riviere Bed & Breakfast, L.L.C.